Designed specifically for use by respiratory therapists, paramedics, and trained emergency personnel, paraPAC enables greater control of breathing parameters. 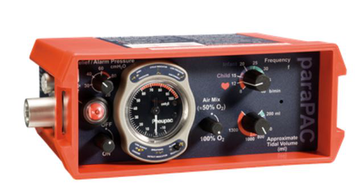 The dual controls allow easy selection of tidal volume and frequency to match your patient's ventilatory requirements. Suitable for ventilation during emergency or controlled transportation of adults, children and infants. MRI compatibility gives maximum flexibility for transport within the hospital. Also available without integrated alarms (Model 120002).